GTAT is still waiting on the 4th and final prepayment is received from Apple. The delay in the receipt of the final prepayment is believed to be related to the ramp up of equipment of equipment inside the Mesa facility. The sapphire plant is expected to be completed in June, which should coincide with the receipt of the final prepayment from Apple. My latest supply chain check indicated that GT has likely installed slightly more than 2,500 furnaces. Sapphire boule size is expected to range between 200 and 235 kg. Stephen Chin of UBS has been one of the most vocal analyst’s covering GTAT issued a note on May 28th related to the progress of GT’s sapphire operations in Mesa, AZ. The UBS research note issued on May 28th indicated that any installed furnaces greater than 1,500 or boule size greater than 165 kg would likely result in an upside to its 2015 estimates of $1.30. UBS stated, “we believe 2015 has more chance for upside if the furnaces are indeed larger sized and there are more than we estimated.” My supply chain check indicates that the number of installed furnaces will be significantly larger than 1,500 and sapphire boule sizes will also be significantly larger than 165 kg, which will lead to major upgrades across the board from Wall Street analysts in the near future. As a result of my most recent supply chain check I believe that the Mesa sapphire operations will have an ample supply to cover the iWatch, the 4.7” iPhone and the 5.5” iPhone with full sapphire cover glass in 2014. Additionally, the maximum sapphire screen capacity of the Mesa facility is likely to exceed 200m annual units. My most recent supply chain check confirms that GT’s sapphire business with Apple is likely to approach or exceed $2B annually, or $2.00 earnings per share using an estimated ASP of $10 per unit. Current Wall Street models are only pricing in Apple business at $1b annual or $1.00 earnings per share. My latest supply chain check indicates that Wall Street will likely need to DOUBLE revenue, EPS estimates and price targets once the iPhone 6 and iWatch are released later this year covered in sapphire glass. I am maintaining my $87.50 price target as well as my 2015 estimate for GTAT EPS at $2.84 based on $3.177B in sales, including just over $2B of sales from Apple versus $1.335B and $1.30 EPS currently being estimated by UBS. Get in early and enjoy my top investment picks. Barron’s released some information from Brian White of Cantor Fitzgerald. White was most recently in the news regarding his belief that sapphire was seen in some iWatch models and that the iPhone 6 would feature sapphire glass. White’s supply chain check indicates, “that initial production of certain “iWatch” components is scheduled to begin later this month and there are plans for a sharp acceleration into fall.” The report also indicated that the iWatch will likely arrive along side the iPhone 6 in September. White estimates the iWatch will be priced between $199-$299 for entry level device. White believes the first iteration of the iWatch is more of a companion device. Since our research suggests the first iteration of the “iWatch” is more of a companion device, and thus requires a connection to an iPhone, we believe unveiling the two new devices at the same time makes sense. White also indicated that the 5.5 inch iPhone 6 is likely to arrive this fall. Furthermore, as we make our way through Computex, our research is uncovering more evidence that the 5.5-inch iPhone 6 will launch this fall. Brian Blair of Rosenblatt Securities May 27th report on the Asia supply chain spotted iWatch models with sapphire screens. Blair also indicated that TPK will make the touch panel for the iWatch. If Blair is correct that TPK will make the touch panel is it nearly a guaranteed lock that the iWatch will feature sapphire cover glass, which will serve as another catalyst for shares of GT Advanced Technology (GTAT). TPK as it is the major supplier of the touch-on-lens (TOL) process that is required to work with sapphire-based cover glass. Apple’s WWDC begins on Monday June 2 and if Apple wants to introduce the iWatch you can expect GTAT and sapphire cover glass to be a major part of it. Reminder: My PTT Research Forensics Newsletter that is scheduled to be published on Thursday June 5th at 3pm EST. My Forensics Newsletter pricing is now available and a special 20% launch discount (for the first 48 hours) will be available when my Forensics Newsletter subscription goes on sale on Monday June 2nd at 12pm EST. My next pick is a company that is built on top of a strong foundation of intellectual property. My analysis of the company’s data and public comments indicate that a “major ramp” in future sales is just getting underway. The company’s C-suite is in the process of scaling up the business and preparing to manage a much larger and more complex company. The company has quietly created an integrated eco-system comprised of software and hardware that continues to extend its competitive edge over its largest competitors. The industry that the company primarily supports is in the early stages of what is expected to be an explosive and long-term growth cycle. 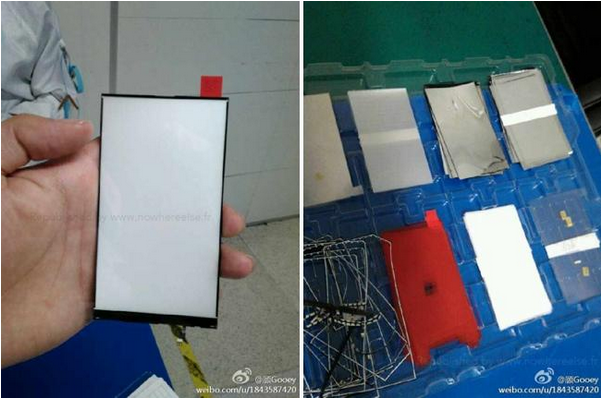 On May 23, 2014 leaked images surfaced from nowhereelse.fr of what appears to be Apple’s iPhone 6 LED backlight. The earliest leaked iPhone 5s backlight images that I could find were leaked on September 7th, 2013 just 3 days before the iPhone 5s invite went out. 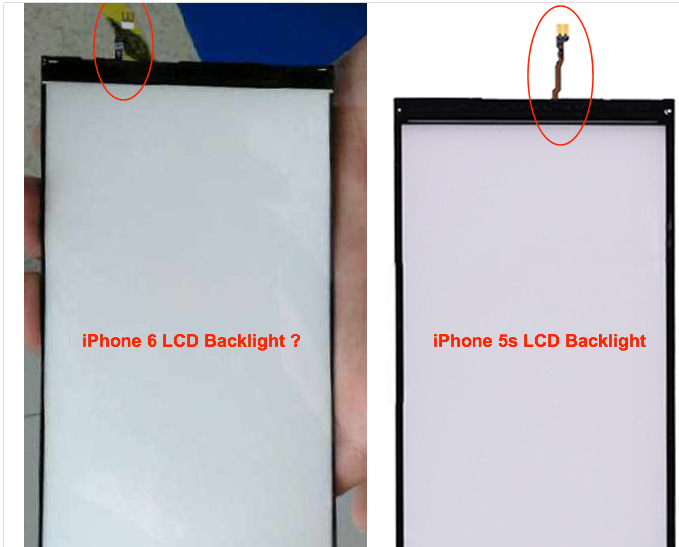 The iPhone 5s backlight images were also leaked first by nowhereelse.fr. In other news Vodaphone just slashed the price of the iPhone 5c on Friday. Target just dropped the price of the gold iPhone 5s to just $119.99 from $199.99 with a 2 year contract. Walmart was the first to offer aggressive reduced pricing of the iPhone 5s to $119.99 back in March. Radioshack in April reduced the price of the iPhone 5s to just $99.99 and the price remains intact today. The wave of iPhone 5s price cuts fall line very closely with an International Business Times article from January, which indicated that Apple will slash the price of 5s by $100 in May 2014. The IBT article also mentioned a possibility of a May and September iPhone 6 release schedule based on news picked from South Korea. The wave of iPhone 5s price cuts and the most recent leaked image of the iPhone 6 backlight indicates that production is underway and release of Apple’s iPhone 6 could come anytime. At this point I’m not expecting a iPhone 6 release at Apple’s WWDC that begins on June 2nd, but every data point seems to indicate that the iPhone 6 release is coming before September. Disclosure: My premium PTT Research Forensics Newsletter is scheduled to launch on June 2nd. The premium paid service option will grant my paid subscribers exclusive content weeks before my analysis is published on Seeking Alpha, the Obscure Analyst blog or any other website. Another advantage of PTT is the subscriber Forum that allows sharing of ideas and analyst Q&A. Did you know, that subscription based investment newsletter are typically tax-deductible? The release date of Apple’s next generation iPhone 6 is a mystery and each analyst and blogger has their own opinion of when it’s coming out. I found one interesting rumor related to the iPhone 6 launch date that goes back to February 2013. I found it interesting that the iPhone rumors began over a year before the product is set to arrive. It also seems apparent that Apple’s 5s/5c launch were just table setters for what is likely to be a blowout product. Apple appears set to launch a 4.7″ along side a 5.5″ iPhone 6 sometime between June 2014 and September 2014 and right now I’m leaning towards the earlier of the two dates. The oldest iPhone 6 release date rumor I could find was based on a research report issued to clients by Jefferies analyst, Peter Misek in February 2013. According to Appleinsider, analyst Misek believes Apple made an unsuccessful attempt to bump up the iPhone 6 launch into the back half of 2013 amid increased competition. We believe a summer CY14 launch was originally planned, but Apple tried to accelerate it to stem its market share losses. The earliest Apple could have launched a 4.8” phone would have been this fall (with a target of Oct); however, our checks indicate that Apple’s suppliers are running into difficulties trying to scale the screen size from 4” to 4.8”. Misek said scaling the in-cell screens from 4″ to 4.8″ has resulted in poor yields — meaning a significant number of display components from each batch being manufactured are not passing the company’s quality assurance tests. As such, Apple is unlikely to be able to manufacture enough of the larger 4.8″ displays to facilitate a full-blown launch of the handset until next spring. In October 2013, Cantor Fitzgerald analyst Brian White indicated that a new big screen iPhone would arrive in 2014 as early as Q2 2014. In November 2013, Susquehanna International Group Analyst Chris Caso shared the same opinion as Misek, specifically that the iPhone 6 would arrive in June, some three months ahead of the 5s/5c launch. Caso also indicated that Apple might increase the price due to the bigger screen display that will be packed in the iPhone 6. Caso also predicted that iPhone 6 may be more expensive than the current iPhone 5S. The company may start increasing the prices of its devices next year instead of lowering it as it will put new technologies to be further ahead in the market. The analyst said the increase in price is due to the bigger screen display that will be packed in the iPhone 6. Thus, iPhone 6 price may start from more than $199. Rumors claimed aside from a larger screen, iPhone 6 will have a sturdier display with the aid of Sapphire glass, which was used to cover iPhone 5S’ TouchID fingerprint sensor. The Sapphire glass is claimed to be twice stronger than Gorilla glass by Corning used in most Android smartphones. Also, iPhone 6 may come with wireless charging feature just like the Google Nexus 5 but with the use of solar panels. In February 2014, International Business Times (IBT) cited analyst Sun Changxu, who felt a June launch of the iPhone 6 along with a WWDC announcement seemed likely. Chinese Web site QQ Tech reported an analysis from analyst Sun Changxu. According to the report, the analyst predicts Apple’s production to start soon as May. It is likely that Apple will introduce iPhone 6 during the WWDC. The report also noted features such as a 4.7-inch screen and 1136 x 640 pixel display. Part of the prediction is a 5.7-inch phablet to follow the smartphone. Analyst Chris Caso indicated in November 2013 that Apple would not only release the iPhone 6 in June but also raise the price of the phone. Followup: In April analyst Peter Misek reported that Apple has been working with carriers to charge and additional $100 for the iPhone 6. Analyst Sun Changxu back in February indicated that Apple’s iPhone 6 production would start as soon as May and would likely introduce the iPhone 6 during the WWDC. Followup: Various component makers have ramped up production beginning in Q2. Additionally, iPhone 6 manufacturer Pegatron embarked on hiring spree in March and is expected to ramp up production of the iPhone 6 in Q2. Nearly 3 weeks ago I reviewed Apple’s supply chain management and I noted that all of the activity occurring within Apple’s iPhone 6 supply chain are 3 months ahead of last year’s pace. The accelerated supply chain activity included; significant price reductions of Apple’s current flagship phone (5s) occurring in March 2014 versus June 2013, component makers ramping production in April/May 2014 versus July/Aug 2013, leaked images of the iPhone 6 are surfacing months earlier and one of Apple’s iPhone 6 manufacturing partners began hiring months earlier in the year compared to the hiring activity that occurred in 2013 just months before the iPhone 5s/5c launched in September. Analysts have been forecasting the iPhone 6 to arrive in June for quite some time. The flurry of recent news and leaks i.e. (production activities, price cuts, manufacturing activity, leaked images, Apple/Carrier price increase discussions and Apple trade-in program) all are signalling an imminent arrival of the iPhone 6. Apple’s 2014 WWDC is just 3 weeks away and it might just be the perfect stage for Tim Cook and company to shock most, but not all of the analysts with an iPhone 6 product launch announcement. I have been closing tracking various activity in 2014 and comparing it to previous years’ activities to determine the likely launch date of the iPhone 6. I did a review of the news regarding production activity surrounding Apple’s supply chain almost 3 weeks ago and the resounding answer was pointing towards a June iPhone 6 launch date. All of the 2014 production activity, hiring, leaked images, carrier discounts are all tracking 3 months ahead of last year’s September iPhone 5s/5c launch. Yesterday, 9to5mac’s Mark Gurman reported that, Apple plans on launching an “enormous” iPhone upgrade even this week to boost sales. The “enormous” trade-in event will help clear Apple’s shelves much like the program launched last September to clear out inventory of the iPhone 5 just weeks ahead of the iPhone 5s/5c launch. Apple’s trade-in program is designed to boost sales of soon to be legacy devices and more importantly to remove excess inventory ahead of the next flagship iPhone product launch. The 2014 trade-in program is just another confirmation that the iPhone 6 is just weeks away from launch. Apple is said to have originally planned to launch the iPhone trade-in program during the last week of July, but the program’s launch was pushed back for unspecified reasons. This program blends nicely with Apple’s Apple Store-based iPhone hardware trade-in program, which allows customers to turn-in older iPhone models to purchase a new model at a discounted price. Apple, in recent weeks, has increased the buyback prices for iPhones in its trade-in-program, according to a source. This event will be held in multiple states across the United States, and Apple is said to be preparing for an influx of visitors to its stores on the levels of traffic driven to stores for new product debuts. Apple will brief Apple Retail management on the initiative tomorrow, according to the source. Additionally, Apple is said to be readying various other new marketing and sales initiatives to improve the sales of the iPhone in its retail stores. All of the data points I have examined indicate that the iPhone 6 launch is just weeks away and line up very nicely with the 2014 WWDC that is scheduled on June 2 through June 6 in San Francisco, CA. The recent announcement of Apple’s 2014 trade-in program just adds more fuel to what is already expected to be a very exciting iPhone 6 launch party. According to the Engineering News-Record, the Mesa, AZ sapphire the majority of the project work has been completed and the project is finishing up now. The facility work began in November and was completed by 400 members of the International Brotherhood of Electrical Workers 640, who worked double shifts for seven days a week to complete the project. Additionally, the article does reference that the Mesa site was declared a free-trade zone, which will eliminate the ability to track shipments coming out of Mesa through customs. Apple says the Mesa project will create 1,300 construction jobs. The United Association of Plumbers and Pipefitters 469, Phoenix, says the fast-track job means work for 200 or more of its members for the rest of 2014. Work includes “installation of condenser water systems, chiller water systems and inert-gas systems [entailing] the use of 48-inch pipes down to six-inch pipes,” said a union spokesman. In addition, the Mesa site was declared a free-trade zone, so goods can be shipped and received internationally without oversight from customs agents. After the market closed today GT Advanced announced that the company would be making its next generation 165 kg, which is an upgrade from the 115kg furnace. GT also announced the company has furnaces that can produce sapphire boules that are “significantly greater than 165kg and that the company intends to keep this more advanced ASF system captive for some extended period of time. What is the big secret about the advanced ASF system and how big is it? In my March 29, 2014 post that was focused on the iPhone 6 margin I indicated that GT was using a 200kg + furnace to grow sapphire inside the Mesa, AZ facility. GT in 2012 was pricing in the cost of sapphire screens using the previous generation ASF furnaces (115 KG) as well as the previous generation diamond wire saw from Meyers Burger. Additionally, the raw materials supply chain for Alumina had not been established. If we fast forward to March 2014, GT is now using a (200 KG+) furnace which represents an improved yield of 74% from the ASF 115 KG Furnace. GT will likely be using the next generation Meyer Burgers diamond wire cutting saws that will substantially reduce kerf loss and improve the fabrication costs to make a sapphire screen. Some of you might be wondering how I would know the minimum size boule that would be produced by the “advanced ASF system”. My source of information of the company’s ASF furnace plans is based on GT’s comments to LEDinside.com prior to announcing the Apple contract. GT was responding to LEDinside’s questions regarding ASF demands driven by Non-LED applications. GTAT predicts that sapphire substrate will be one of the growing markets in 2014. ASF currently produces 115 kg of the world’s sapphire. In regards to demand for LED and optical application, production capacity is already enough but sapphire substrate in non-LED applications including smartphone camera lens caps and home button covers, as well as the possible usage in smartphone displays by the end of 2014, demand for sapphire substrate is expected to rapidly increase. The company plans to increase sapphire furnace production to 200 kg. GTAT emphasized equipment purchased by clients can be directly upgraded, and thus reduce costs for clients as they do not need to purchase new equipments. 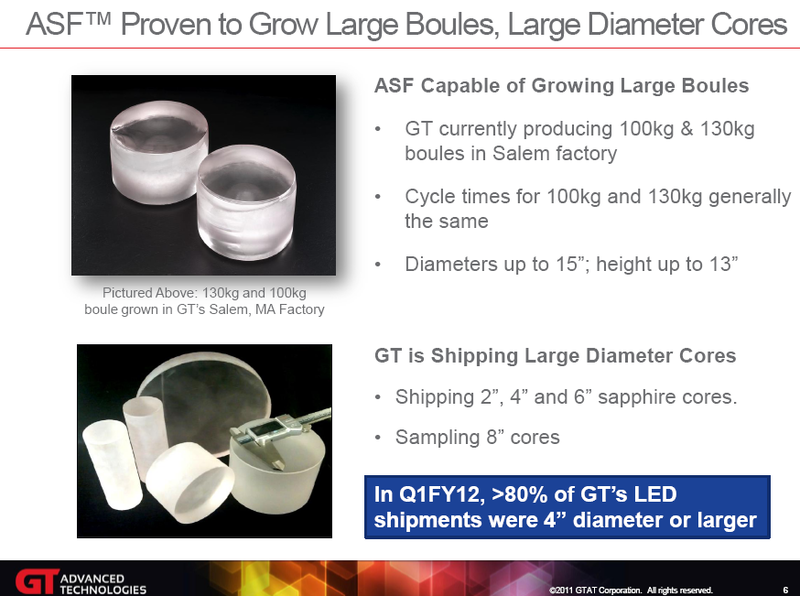 I pulled up a 2011 GT presentation on Sapphire and LED and I found it interesting that GT was growing 100kg and a 130kg sapphire boule in Salem, MA but was only selling ASF 115kg furnaces to customers. GT delivered a few messages that are resonating clearly withe me based on today’s announcement. #1 GTAT is using ASF furnaces that are capable of producing 200 to 230kg boules inside the Mesa, AZ facility, which would represent a “significant” ~ 40% increase over the ASF 165. #3 This is not the first time that GT has been using larger ASF systems for their own use versus those sold in volume to customers. #4 The 2014 “sapphire forecast” today’s announcement certainly muddies the waters and will make it even harder to figure out the sapphire mix between Apple and GT equipment. #5 Today’s ASF furnace announcement just opened the door to GT to increase its 2014 revenue and EPS forecast due to sapphire and nobody will know if its driven by Apple material sales or ASF equipment sales.